One of the handiest tools to have in your ’02 workshop is a pressure bleeder. Once you have acquired one, you will never have to beg your wife or significant other to help you bleed the brakes again. 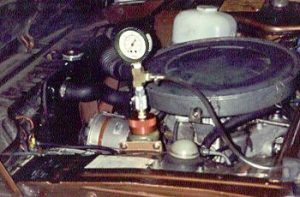 The basic concept of the pressure bleeder is to mimic the master cylinder by pressurizing the hydraulic system. 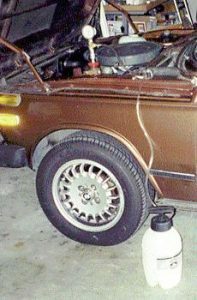 By pressurizing the brake fluid reservoir, fluid is forced past the seals in the master cylinder and into the brake lines. Since the pressure levels are relatively low, the seals in the master cylinder will not be damaged. The end result is that you can force fluid and trapped air bubbles through the brake lines and out the caliper and cylinder bleed ports. It really doesn’t take much to construct a pressure bleeder. One special part needs to be obtained from a vendor, while the rest are available at a good hardware store. 1. The special part is a custom made anodized aluminum cap for the brake fluid reservoir. The cap comes with the male portion of a pneumatic quick disconnect already installed. It is truly a work of art and can be obtained at The Ultimate Garage www.ultimategarage.com, for about $50 including shipping and handling. If you are thrifty and resourceful, you could probably make your own from a used reservoir cap. Attempting to make a pressure tight cap might be more trouble than it is worth, especially with such a fine unit available. 2. A small hand held garden sprayer with a hose barb for the output line. It doesn’t make much of a difference if you buy a fancy expensive one or the cheapest one. I paid about $15 for a plastic 2-gallon version. 3. A brass tee with 1/4″ pipe threads, $2.50. 4. A 0-30 psig pressure gauge. It may take a while to find this item since not all hardware stores carry them. Make sure that the threads on the brass tee match those on the gauge. It should cost about $5 to $10. 5. About 6 to 8 feet of ¹” diameter plastic hose. You can use the clear plastic Tygon tubing. Expect this to run about $2 to $3. 6. A small brass hose barb that will fit the hose and the tee. $2.50 should cover the costs. 7. The female half of a pneumatic quick disconnect. There are several different sizes of quick disconnects available, so it’s wise to bring your brake reservoir cap along to make sure you get the correct one. Also, make sure the threads fit the brass elbow. If memory serve me correctly, I think I paid $5 for this piece. 8. A handful of small hose clamps. $2 total.16. Now that you have gathered all of your bits and pieces, it’s time to start the assembly. 1. On the garden sprayer, remove the hand wand and the short length of hose that was supplied with it. Replace it with the new plastic hose and secure it with a hose clamp. 2. Install the hose barb into the center branch of the brass tee. It’s a good idea to use Teflon tape on the pipe threads to provide a tight seal. 3. Install the pressure gauge and any adapter fitting that is required to the brass tee. Use Teflon tape on the pipe threads. 4. Finally, attach the female portion of the pneumatic quick disconnect to the brass tee. Don’t forget the Teflon tape! 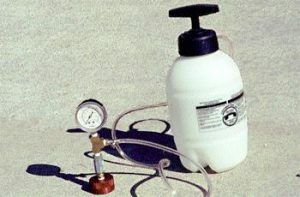 To check out the pressure bleeder, start building up pressure in the garden sprayer by using the hand pump. With the brake reservoir cap attached, you should feel pulses of air coming out of the port in the cap. Remove the cap using the quick disconnect and the system should seal. As you pump the garden sprayer, pressure will start to build in the system. If everything is hooked up correctly, you will be able to monitor the pressure with the gauge. If everything is leak tight, your pressure bleeder is ready to use! Before using the pressure bleeder, make sure that you top off the reservoir with fresh fluid. After you attach the new reservoir cap, start pumping the garden sprayer to build up pressure in the brake reservoir. Once you have 10 to15 psig showing on the gauge, you can go around to each of the bleed ports and follow the standard brake bleeding procedure. As with the standard procedure, you need to be careful not to run the reservoir dry. To refill the reservoir, use the quick disconnect fitting then remove the cap and top off. Once you refill the reservoir and reconnect the cap to the pressure bleeder, you will probably have to use the hand pump to raise the pressure in the system. A couple of comments on the ’02 hydraulic system. You may need to install hose clamps on the lines that go from the reservoir to the brake master cylinder and the clutch master cylinder. Otherwise, these lines may leak when pressurized. If your clutch slave cylinder is old, you may see fluid dripping past the cylinder rod seals. This does not necessarily mean that the slave cylinder is bad, just that the pressure in the brake reservoir is too high for the seals in the slave cylinder. Slightly reduce pressure in the system to minimize the amount of fluid loss. There you have it! The last time I used my pressure bleeder was in the wee hours of the morning after I installed new stainless steel brake lines. I bled the two front wheels of the car by myself using the pressure bleeder in about 10 minutes.